TJS Wake School is owned & operated by Travis Sloan. 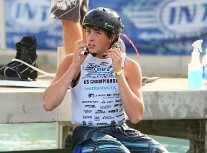 Travis has earned the right to call himself an expert wakeboarder. For more than eight years he has competed from North Carolina to California and held the title of NC State Champion(3 yrs in a row) for the Men's INT League. His passion for wakeboarding has lead him to become an instructor. For the past four years, he has shared his expertise with riders of all skill level and ages. He can teach you how to get up on a wakeboard, how to jump the wake, and even flips and spins. He also teaches wake skating, water skiing and wake surfing.